With both ‘Edgeband Size Vars’ and ‘Add Nesting Contour’ turned on, ONGAA CAM will automatically create a ‘bounding-box’ contour and associated a Vertical Route process with it. All process options are configurable including Tool, direction, compensation, approach and even ‘midline start’. Simple open the part, start a program and set the edge band thickness. ONGAA CAM will do the rest. Each part in the assemble will be generated with a ‘Nesting Contour’ suitable for Cut Rite to load. 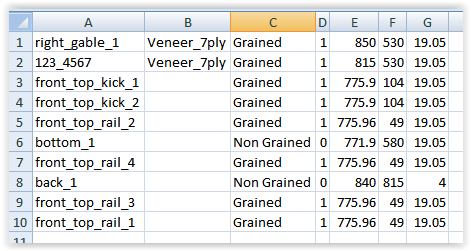 ONGAA CAM also generates a CSV file suitable for Cut Rite when ‘Generate Customer MPRs’. This file holds the part names, materials, grained or not/ direction of the grain and part dimensions. Either way – from MPR or from CSV, getting from Solidworks to machined parts just got easier.